I present to you, the second in my series of vaguely coherent, quickly researched pieces on BC truck manufacturing history. Last time I gave you an outline of the history of Pacific Truck & Trailer. This time, I give you the Butler Brothers/Oldfield behemoths, sometimes known as the “Roller Skates”, or just “Skates”. 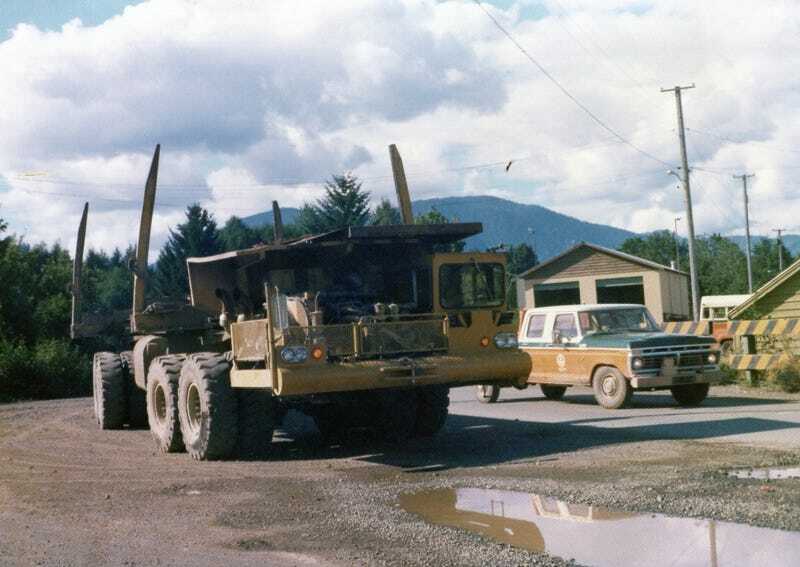 Around 1960, two of the brothers of Butler Brothers logging, wanted a different kind of logging truck, one that could haul more over rougher terrain. They and their friend, Basil Oldfield, designed and built their first truck in Oldfield’s shop. It had a Detroit Diesel, most likely a 12V71, driving all 8 wheels mounted on articulating bogies under each end. After the first effort, they changed the design somewhat, using heavier running gear, and made two examples of the second type, one with a 12V-71, and one with a 16V-71. Due to the lower cab and general stance of the truck, these two are where the “Roller Skate” name came from. I believe these were the first to be used with pup trailers as well, or maybe just the one with the 16V-71. The goal of this one was to carry 100 tons, which seems like an odd number to design a whole new truck around, since Pacific P16s and Hayes HDXs were known to be hauling 100 ton loads around at the time. Now for the fourth truck, the Mark 5. This was the ultimate expression of their idea, while also being a compromise, since new rules fo heavy trucks in BC didn’t allow them to continue with their articulated power bogies. It was designed with the input of a Kenworth designer, and with adaptation to mining in mind. This one was built between 1973 and 1974, and has the most info and pictures available. The bogie design was replaced with conventional fixed rear axles, and a twin steer unpowered front end. It had a turbo 16V-71 making 800hp, with plans to increase that to 1000hp. 121,000lb Clark rear ends, and comically massive tires. With the trailer, it looks like it could carry about 250 tons of logs. There was even air ride for the cab, since the previous trucks were apparently quite uncomfortable. Here it is doing some flexing. Their plans to build more Mark 5s and sell to mining and logging companies never panned out, and after running it for a couple years, it looks like it was sold between other local companies for a few years before being parked for good. The Mark 5 is the only one left, as far as I can tell. It’s sitting in someone’s yard, who also bought either the second or the third in the early 70s to use the running gear for a Kenworth 849F, and the other was most likely cut up for parts by the Butler Brothers when they were building the other. As for the first one, no one seems to know what happened to it. The Mark 5, as of a few years ago. The running gear and rear axles are long gone, there’s basically only the skeleton left. So that’s that. Supposedly the biggest logging truck in the world, and her predecessors, all built on Vancouver Island in BC. If you want to do more reading, I’d suggest this thread on Heavy Equipment Forums. There’s also this page on the site dedicated to the car that Basil Oldfield designed and built, the Spirit of Tomorrow, seen here in front of one of the Roller Skates. I’ll leave you with some more pictures of the trucks.